Ash Thorp’s involvement on projects is a rotation of numerous roles from graphic designer, concept/digital artist, illustrator, animator, creative director, to director. He originally gained recognition for his UI (user interface) graphics in feature films, such as Ender’s Game (2013) and Total Recall (2012), and the video game series Call of Duty (Black Ops 3, Advanced Warfare, Infinite Warfare). Soon after, he was able to additionally showcase his directorial attributes by co-directing with Chris Eyerman of 3AM, “Ares - Our Greatest Adventure,” featuring Neil deGrasse Tyson in a promotional trailer for the feature film, The Martian. Ash also created a graphic series titled Lost Boy; a concept short film for Lost Boy was released in November 2016 and is in further development alongside his co-director, Anthony Scott Burns, and production company, Post Panic Pictures. 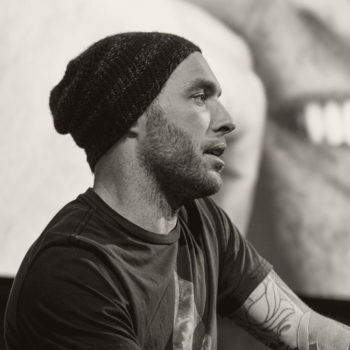 Compelled to give back to others in the industry, Ash Thorp created The Collective Podcast in 2013, with co-host Andrew Hawryluk, as a way to personally share his experiences and connect artists from all over the world together. He aimed the podcast at exploring the struggles of work/life balance and to share the experiences of influential creatives from all realms of creative and artistic media. Furthermore, in 2015, Ash co-founded Learn Squared, Inc., an online educational platform for creatives with a core mission to provide affordable, quality instructional programs worldwide. No matter which phase a creative may be at in their career, veteran or beginner, it’s important to never stop growing or learning.